Web Site Developer, CD-ROM Producer, Corporate Video, Web Design, Professional Web Management, ADA 508 compliance, e-Commerce Solutions, Merlin Media, Inc.
We know that not everyone writes project specifications for CD-ROM or DVD projects every day. We also know that a larger percentage of potential clients have never written any sort of project specification. To assist our clients, we have created a special 'fill in the blanks' project spec template. All you need to do is take a few minutes to fill in as much detail as you currently know about your project. Submit it to us. It contains the sort of questions that need to be answered up front to be able to give you a quote and to make your project a success.  Graphic designor, we can create custom graphics specifically for use on your CD. We even create custom CD labeling.  Animationsour graphic artists can animate practically anything: logos, rotating products, motion tours, etc. We typically get two main types of questions: 1) What will a CD-ROM or DVD project cost; and 2) Aren't CD-ROMs and DVDs expensive to produce? The first question is difficult to answer. The reason is simplein order to let a client know what a CD-ROM or DVD project might cost, we need to know what the disc is going to contain, how it will be used, and other questions with answers that are always specific to each project. Click Here to read our somewhat lengthy document on why it is practically impossible to give a "fast quote" based on "I'm not sure what I want, but how much will a project cost me" information. The second question is a little easier, but also requires that we know a bit about what you actually want. Are CD-ROM and DVDs expensive? 3) What type of packaging do you want. As with anything, producing a smaller number means that the cost of each copy will be higher; the more you produce, the less each one costs. And the faster you need them back, the higher the cost. And the fancier the packaging, the longer it takes to create and the higher the costs. So, are CD-ROMs and DVDs expensive? Well, if you need to get new product information out to your 1000 field sales staff members, reproducing CD-ROMs for less than $1.00 each, or DVDs for just a little more per copy, can be a lot less than reproducing glossy sales brochures. And you just can't put video clips into a paper-based brochure. Or audio. Or user-tailorable presentations. Or interactive catalogs with a fast "look up" feature. Only need a dozen or so copies of your finished project? We can do that as well. 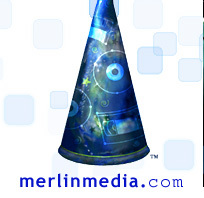 Or any of the many other things that Merlin Media can help you with for your next CD-ROM or video DVD project. © 1994 - 2005 Merlin Media, Inc. All rights reserved.